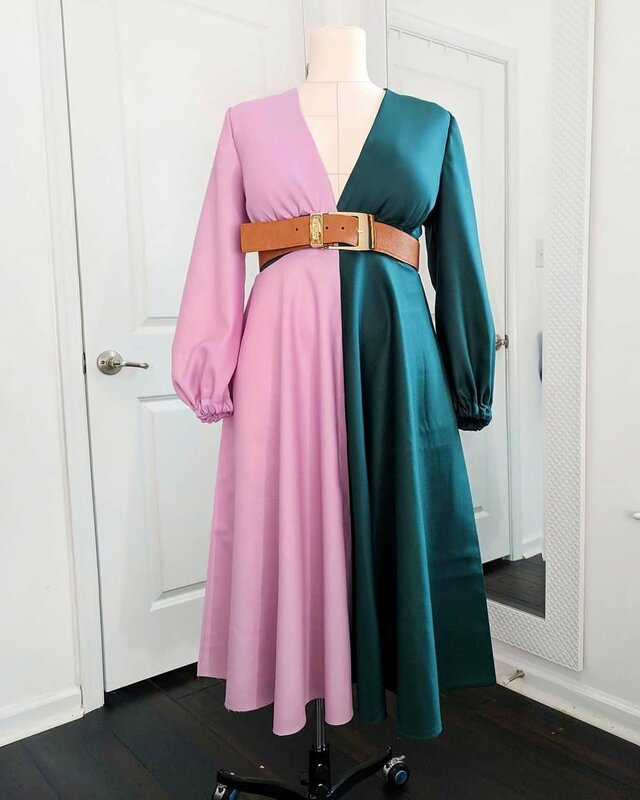 I have so many looks on my vision board that I wanted to create for Fall and this color block garment is on my vision board was actually a sweater, but I thought why not create a dress with this concept. In September, Pretty Girls Sew did a sew along on McCalls pattern 7802 and I thought that this pattern would be perfect for a color block look I’ve been wanting to do. I did several modifications to create the look that I was going for. I will have them listed below. I knew right away what colors I wanted to do because I am always inspired by my favorite blogger, Blaire. She ALWAYS has the best looks (I’ve created several of them) and the best color combinations in her outfits. I’m literally obsessed! The color combo I chose was a lavender and emerald green. It’s such an unexpected color combination that I honestly would not have thought of on my own. That’s where Blaire comes in. LOL! She posted a lavender and emerald green outfit on her blog and I was drooling over the entire look. The color palette was so eye catching, so I knew I had to recreate it. So there’s that. Waistband was shortened to 2.5 inches.